Since Kahn proposed the separation between servant and served spaces - transforming the former into the invisible infrastructure that allows the splendor of the latter - the distinction has remained valid as a design tool. But when servant spaces happen to contain the building’s own systems, such segregation becomes problematic: the building no longer relies on its own infrastructures, but these also require excessive energy. In the 60s, a new building typology was introduced in Chile: offices with lightweight façades (often glazed) that rely on active systems for comfort conditions. This is the result of a global search for twentieth century architecture, which valued the open plan, spatial continuity or curtain walls. However, as the envelopes became lighter - to the point of becoming structurally dispensable - they also lost the thermal, acoustic and solar insulation capacity that walled structures offered. The search for a suitable structural principle in this new typology depends on the integration of the mechanical systems, especially in high-rise buildings (Ábalos & Herreros, 1992). Thus, if the open plan is supported by a pillar structure, an infrastructure network of ventilation, air conditioning, artificial lighting, communication and data networks support the façade’s transparency and its lightness. Today buildings are no longer unique objects, but reproducible commodities given similar urban and logistical conditions, forming an infrastructure with routines and schedules to organize production and consumption. Cities and buildings around the world are built according to infrastructure technologies (Easterling, 2014). The definition of infrastructure is often used for large-scale structures, systems or networks that, although necessary, remain invisible or aspire to stay in the background. However, at the scale of the building, segregation between systems and spaces allows us to understand that these invisible systems are the building’s own infrastructure. We can thus ask, what are these infrastructure networks in buildings and how do they work? What implications do they have on architecture and building façades? The following article analyzes the relationship between architecture and infrastructure within the building by assessing how efficient and effective is the connection between them. Specifically, we will address the paradox of current office buildings in Santiago where, although the mild Mediterranean climate supposes minimum requirements, overheating by radiation and internal charges, urban noise, ventilation and air renewal, glare at workplaces and energy consumption have not yet been solved by these buildings’ infrastructural systems. For international standards, energy consumption in office buildings is perfectly summed up in energy balances. Chart 1 describes the situation in North America, Spain and England, where office buildings represent between 2% and 3.2% of global consumption. Particularly striking are the consumption profiles, since over 70% is related to lighting and air conditioning, both aspects directly linked to the buildings’ architecture. The case of Spain is probably the one that most closely resembles that of Santiago due to climatic conditions, comparable to those of Chile's central areas (Pérez-Lombard, Ortiz and Pout, 2008). Chart 1: Energy consumption for office buildings, 2003. Given the possibility of calculating the dynamic behavior in structures over 14 stories high, high-rise buildings began to be developed in Chile during the sixties (AUCA, 1969a). But this structural possibility implied not only a challenge for construction tasks, but also for systems and technical facilities. One of the first examples on the subject was Tajamar Towers complex - whose main building was 27 stories high - facing issues such as implementing elevators that doubled the height and speed of existent ones back then, or the need to pump water and solve sanitation arrangements through new strategies (AUCA, 1969a). But unlike residential buildings, office towers bear loads and have use forms that turn them into artifacts of a different nature, even in terms of their height. They must allow the free flow of people entering and exiting the building for various reasons; in addition, work concentrates many people in small spaces, stressing the internal thermal balance and, with it, energy networks. In turn, natural lighting must comply with the required standards as uniformly as possible to avoid the use of artificial light. Finally, they are used continuously during the day, requiring constant interaction with the climate of those places where they are located. In Chile, the first building to face such issues was the Endesa building (1965) by architects Echeverry, Larraguibel and Aguirre (Figure 1). It was a pioneer building in several aspects: automated elevators (did not require an operator), centralized air conditioning, a telephone exchange central with 120 lines and 600 annexes, and artificial lighting designed to ensure 500 lux in every work station. Here, the exposed reinforced concrete structure was pushed to the slabs’ edge in order to provide as much freedom as possible to the office plans, while the transparent enclosure was moved to the internal side of pillars creating eaves as sun protection. The envelope consisted of a lightweight aluminum façade with practicable windows bearing an ‘imported polarized glass,’ which today should be understood as tinted glass. Being a pioneering experience, several issues required the architects’ attention: ventilation ducts took the air from the cafeteria’s kitchen to the offices, glass did not provide the expected solar control and windows had to be covered with a layer of additional protection, and the climate system was not able to reduce the internal temperature, which reached 26 or 27 ºC (AA.VV, 1969b). The building’s energy demand was also a pioneering feature, comparing its consumption at the time with that of the whole island of Chiloé. 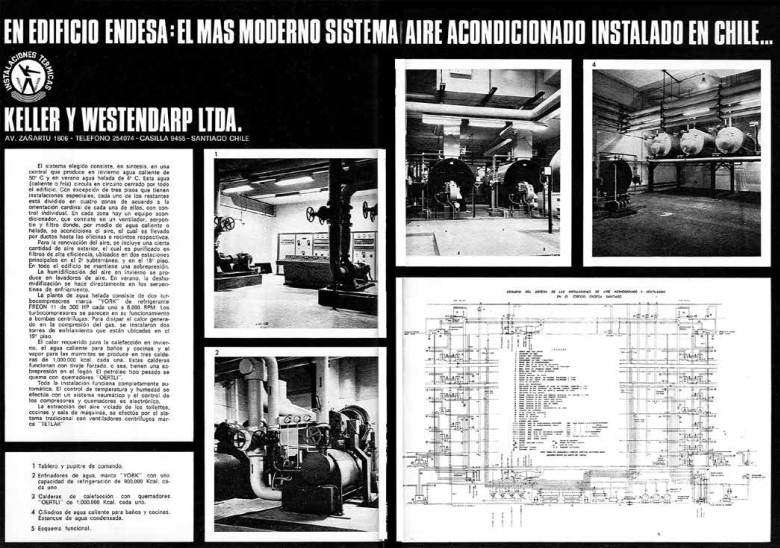 Figure 1 Ad for Keeler and Westendarp’s air conditioning system in the ENDESA Building. Still, office buildings with lightweight façades and artificial air conditioning became a standard in Santiago since the 90s. Its typological simplicity - a rigid core that comprises circulations, a slab system attached to the core through a lattice structure supported by pillars in the perimeter and a façade attached to the edges of the slabs - resulted in an open plan that allowed a flexible workspace layout, based on corporate efficiency models consolidated in the usa after wwii (Arnold, 2005). Such configuration, however, supposes a tension between the interior environment of buildings and external climate conditions, where solar radiation jeopardizes the desired benefits of transparency. - Cluster 1: curtain wall buildings, without solar protection, of over 35,000 m2 of built surface. - Cluster 2: buildings with a mixed façade, with or without curtain walls, without solar protection and around 10,000 m2 of built surface. - Cluster 3: a special cluster with a unique case due to its size. Its façade is a curtain wall without solar protection. - Cluster 4: buildings with walled façades with spans, and built surfaces of around 10,000 m2. - Cluster 5: curtain wall buildings with some type of solar protection, of sizes around 16,000 m2. From a methodological point of view, our approach has involved energy audits to distinctive cases in each of the clusters, applying protocols2 to establish energy consumption profiles, quality of lighting (both natural and artificial), quality of interior thermal environment and user perception. All measurements were seasonal and were recorded in a database for further analysis. The protocol to measure energy consumption considered air conditioning, lighting and power in some floors of each case and the measurement of air conditioning system of the whole building. The lighting protocol considered the measurement of illuminances in different types of workstations, according to their relationship with windows and their orientation within the plan. The internal thermal environment quality protocol was based on the thermal zoning of each of the cases, combining instrumentally measured information with the users’ perception. Chart 2 shows the results of energy protocols according to case study, cluster and total. The unique situation of cluster 3 is explained by the fact that current legislation regarding electricity pricing (Ministry of Mining, 2000, Ministry of Economy, Development and Reconstruction, 2007) establishes that, for supplies to users whose power is less or equal to 2,000 kW (considered a monopoly provider) prices are regulated, but for supplies to users with power exceeding 2,000 kW, the law allows flexible rates, assuming that they have the capacity to negotiate (CNE, 2015). Such differentiation, typical of a pricing system based on an efficient allocation of prices, does not consider the efficient use of energy resources, since, in practical terms, encourages greater consumption for the largest consumers. Chart 2: Annual Energy Use (AEU) for each cluster. As reference for the assessment of these results, Chart 3 shows energy consumption standards for office buildings in different countries of the European Union, during the same years when energy audits were carried out. 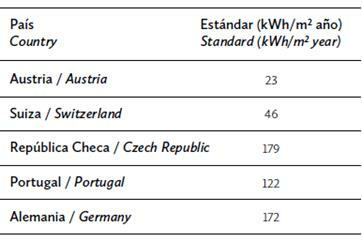 As shown above, national standards are comparable to the largest energy consumption references in Europe; however, climate is a factor that helps in differentiating, since Chile's central areas could only be compared to those of Portugal. It is also important to consider that these consumption standards enable high hygrothermal and light comfort performance in buildings, a subject that directly concerns architecture and which, as we shall see, is not such in our case. Chart 3: Normative consumption standards for office buildings in EU countries. Chart 4 shows the results of hygrothermal comfort assessments. Thermal comfort hours correspond to the percentage of temperature and humidity measurements in buildings within the specific comfort range for each season according to iso 7730 (20 °C to 24 °C in autumn and winter, 23 °C to 26 °C in spring and summer, relative humidity between 20 and 70% for the entire year). Results show that all cases have a rather low hygrothermal performance. Case 1, the one that consumed the most energy throughout the period (246.83 kWh/m2 year) is consequently the one with the best hygrothermal performance (71%), even though it remains low according to the expectations of achieving 100% comfort hours. In general terms, the performance in all clusters is about 60% of annual comfort hours, results that are not consistent with the expectations of having climate-controlled buildings where people develop activities from which a certain productivity is expected. Chart 4: Hours of hygrothermal comfort (%) for each case and cluster. Finally, Chart 5 shows the survey on hours of light comfort, which corresponds to the percentage of illuminance measurements in buildings that were within the comfort range according to iso 8995-1 (500 to 2000 lux on top of workstations). Measurements were made in workstations representative of each orientation and degree of depth within the plan for each case study, over 200 measurement points for the entire sample. A low-quality lighting environment within workstations is deduced from the chart, one that does not merit analysis given the low performance in all of the cases. Light availability (illuminance) is the result of a set of factors combining natural light and its reflections in space, determined by the depth of the plan; thus, artificial lighting must function as back-up in situations where natural light is not enough. In the cases studied, it has been observed that artificial light works unrestrictedly during the day and that solar radiation control is usually the cause of poor natural light in workstations. It should also be mentioned that lighting comfort goes beyond the availability of light (illuminance) and considers the quality of the lighting environment (luminance); however, for none of the cases was it possible to apply measurement protocols of such feature due to low levels of available light. Chart 5: Hours of light comfort (%) for each case and cluster. Over 50 years after the construction of the Endesa building, the strategy of maximum transparency in façades supported by an infrastructure of facilities continues to pose the same challenges that, in Chile, we have not yet been able to address from the point of view of energy consumption or user comfort. Architectural exploration on transparency has not yet considered the building dimension as components of an infrastructure system with which it can and should interact, instead of just depending on it. Data shows that, in a significant number of cases studied in Santiago, the quality of interior environments in buildings today is poor, despite receiving significant amounts of energy. Behind this issue is the evident lack of regulation. Worldwide, strategies and regulations to address these issues consider two features: the infrastructure system and façade performance, both in relation to those conditions required by the users. In Chile, regulations or standards to guarantee environmental comfort and energy efficiency in offices remain almost non-existent. The prescriptions of the Ordenanza General de Urbanismo y Construcción (General Urban Planning and Construction Ordinance) limit themselves to establish thermal transmittance requirements for façades in dwellings, which do not apply to commercial buildings. Moreover, when considering both building and energy distribution as a system, the tariff structures focus on price assignment efficiency and not on energy efficiency of a system where prices can function as an incentive for better thermal performance or user comfort. The large office buildings with transparent façades that are being built today in Chile rely on and are part of a system of infrastructure networks (energy among others), demand a large, permanent supply, but have not yet assumed their role as part of it or their potential contribution to a better performance and efficiency of the system. However, if we focus on infrastructural systems in the building, we can see that their relatively short lifespan (20 to 25 years) opens up to the technical feasibility of its replacement and poses an opportunity to reformulate both the systems and their operation logic within the building. Architect, Pontificia Universidad Católica de Chile, 1993. Master in Architecture, Cornell University, USA, 2004. Has authored the book Acondicionamientos: Arquitectura y técnica (Santiago, 2008). Researcher at the Center for Sustainable Development, CEDEUS. Assistant Professor at the School of Architecture of Pontificia Universidad Católica de Chile, where he works as a researcher, professor and Head of Magíster en Arquitectura Sustentable y Energía, MASE. Architect, Master in Architecture, Pontificia Universidad Católica de Chile, 1995. Doctor in Architecture, Universidad Politécnica de Cataluña, Spain, 2008. Expert in sustainable architecture and Smart Façades systems, has led several Fondecyt projects on energy performance and office buildings in Santiago. Founder and member of the Study Group on Architecture and Facades UC. He is currently Principal Researcher at the Fondef I+D project “Fachada Variable: Solución de fachada dinámica en base a patrones de movimiento coordinados para el control solar y lumínico aplicable en Santiago de Chile”, as well as being an Associate Professor at the School of Architecture UC. Architect, Master in Architecture, Pontificia Universidad Católica de Chile, 2016. Specialized in sustainable architecture, focused on thermal and light evaluation of façade systems. Has been TA and professor in several courses on ​​building and technology areas. Currently works as coordinator at Fondef project I+D “Fachada Variable” at UC.